Faced with continual change in care delivery and reimbursement, healthcare institutions across the continuum are tightening the purse strings and charging their teams to do more with less. For many medical staffs, this means capturing strong performance data on a growing array of clinicians and meeting increasingly rigorous quality standards without the aid of sophisticated software, appropriately trained staff, or comprehensive resources. 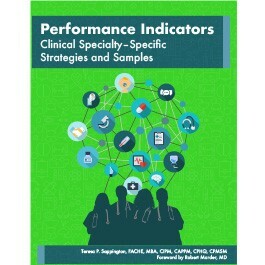 Featuring an unmatched combination of expert-vetted measures from the field and actionable guidance on their broader implementation, Performance Indicators: Clinical Specialty-Specific Strategies and Samples equips medical staff leaders, MSPs, and quality professionals with the tools and know-how to capture holistic competence data for clinicians spanning specialties. Expert author Teresa P. Sappington, FACHE, MBA, CIPM, CAPPM, CPHQ, CPMSM, provides in-depth strategy on selecting, structuring, operationalizing, and ensuring the continued effectiveness of professional practice evaluation metrics. Beyond this strategic deep dive, Performance Indicators features dozens of measures that healthcare institutions are leveraging in their OPPE and performance monitoring activities. It also includes practical application information, including the rationale behind the indicator’s development, the clinicians it can be used to evaluate, and potential data sources and collection techniques. All this information is presented in two types of easy-to-read grids. Drawing on the ACGME’s popular evaluation framework, competency-specific grids showcase general indicators that apply to many clinicians, while specialty-specific grids feature effective indicators for emerging disciplines and other hard-to-evaluate clinicians, including telemedicine practitioners; pediatric and surgical subspecialists; and advanced practice professionals. Implement practical performance indicators and appropriate criteria for their evaluation, including best-fit thresholds and benchmarks. Streamline your search for meaningful metrics. Reader-friendly grids, field-sourced indicators, and expert implementation guidance make for a reliable, single-stop alternative to researching one-off sample performance measures. Gain unique insight into what’s working in the field and how it can be adapted to meet your organization’s OPPE and performance monitoring needs. Overcome pervasive data-capture pitfalls, including case attribution for advanced practice professionals, development of actionable measures for low-volume and locum tenens practitioners, and competence assessment in nontraditional healthcare settings. Comply with relevant federal, state, and accreditation requirements regarding practitioner performance evaluation. Teresa P. Sappington, FACHE, MBA, CIPM, CAPPM, CPHQ, CPMSM, is a consultant specializing in medical staff affairs and healthcare regulatory compliance. She is a healthcare professional with more than 20 years of experience directing diverse medical staff and serving as an advisor in a wide variety of healthcare facilities, including healthcare systems and multi-site, acute care, community, rural, urban, academic, and faith-based hospitals. Sappington is adept at managing busy day-to-day operations while implementing best practices. She inspires individual and organizational excellence, creates a shared vision, and manages change to guide an organization to strategic goals and successful performance. Sappington applies business principles, including systems thinking, to the healthcare environment, with proven ability to mentor and create strong staff leadership teams. Robert Marder, MD, is president of Robert J. Marder Consulting, LLC. He brings more than 30 years of healthcare leadership, management, and consulting experience to his work with physicians, hospitals, and healthcare organizations nationwide. A highly respected speaker, consultant, and author, he has helped hundreds of hospital medical staffs evaluate and improve their approach to peer review and physician performance measurement. He is the author of Effective Peer Review, Fourth Edition (HCPro, due out September 2017) and Peer Review Benchmarking: Pursuing Medical Staff Excellence (HCPro, 2016).